We completely redesigned the text editor in Quizmaker 360 to give you even more control over text formatting and placement. 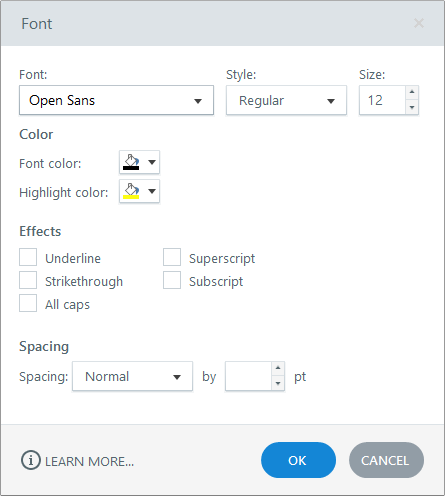 In this user guide, we'll explore the font formatting features. For paragraph formatting options (alignment and spacing), see this user guide. Select the text you want to edit, then go to the Home tab on the Quizmaker ribbon and use the Font formatting options. Hover over the buttons in the Font group to see their functions. You can apply formatting to an entire text box, or to a single word or paragraph in the text box. To quickly select a word, just double-click it. To select a paragraph, triple-click any word in the paragraph. The colors in the font color selector are controlled by your theme colors. To customize them, see this user guide. For even more control over your text, right-click the text box, choose Format Shape, then select the Text Box tab on the left side of the window that appears. Learn more about formatting text boxes here. Many of the same formatting tools on the ribbon (see above) can also be found on the Font window. Just select the text you want to edit, then click the arrow in the lower right corner of the Font group on the ribbon. The following window will open where you can edit several font attributes. Use the following shortcuts for common tasks to work even faster. Find more keyboard shortcuts here. If you need to apply the same formatting to multiple text elements, double-click Format Painter to keep it turned on. Click it once more to turn it off when you're done, or press the Esc key on your keyboard.